Concentrating on the fast growing SMB and mid-market segments in the country, Hewlett-Packard India has launched five ‘Imaging and Printing solutions’, off the shelf ‘ePrint Enterprise’ products that have been scaled down to meet smaller sizes and lower cost requirements. According to HP India, many SMB and mid-market business owners have approached them, and their partners, looking for imaging and printing solutions similar to what HP offers its enterprise level customers – wanting to move from “printers to solutions”. Some of the most important concerns these companies expressed were cost accounting, tracking and the protection of their investments. To address these demands, HP brought five of its ePrint Enterprise services in a ‘solution-in-box’ model, to help SMBs and mid-market customers buy them, off the shelf, like any other product. For now, customizability of the solutions is minimal, but working with its channel partners, and following a more extensive training of the HP Document Solution Specialist Program, HP India hopes to provide user-configurable solutions in the near future. HP will be offering licences as small as 50 users initially, and aims to do so at a cost that would justify the expense for even smaller companies (which are of course, expected to grow in time). The solutions launched were: HP Imaging and Printing Security Center, HP Access Control Professional and HP Access Control Express, HP ePrint Enterprise mobile printing, and HP EcoSMART Fleet. The HP Imaging and Printing Security Center is a single interface administrative tool that helps companies manage their printers and users, and also provides such features as department wide policies. HP Access Control features everything from PIN authentication and tracking back (in Express), to quotas and cost allocations (in Professional). HP EcoSMART Fleet will give companies a way to track their energy expenditure and carbon footprint, and with expert analyses from trained efficiency technicians, promises for up to 30% costs reduction, and up to 80% reduction in energy expenditure. With FutureSmart solutions, HP hopes to ensure protection of the companies' investments, with simultaneous firmware upgrades across entire fleets, including older devices – so that the ‘old works with the new, the new works with the old.’ Relevantly, HP’s new printers and their FutureSmart firmware work on an Open eXtensibility Platform (OXP). For now, HP’s providing the OXP API and software development kits to select partners, for them to develop apps – in the future, the company aims to open the API out to third-party developers. 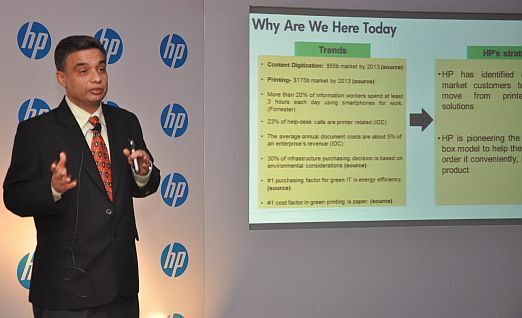 Nitin Hiranandani, Director, Printing Systems, PPS, HP India addressing media at the HP solutions launch. Gurpreet Kanwal, Country Business Manager, PMPS and Solutions, PPS, HP India addressing media at the HP solutions launch. HP Launches Innovative Solutions for Imaging and Printing for SMB’s. 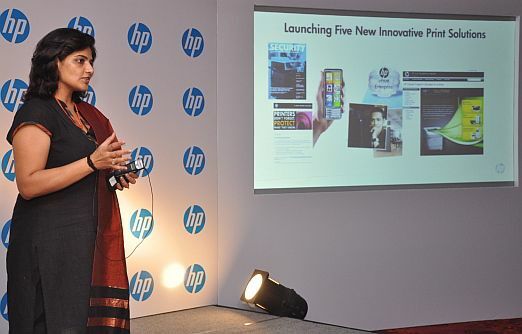 July 20, 2012, New Delhi: Hewlett-Packard India today announced the launch of five new Imaging and Printing solutions specially designed to meet the needs of the SMB and mid-market segments. These solutions help businesses increase efficiency and control and secure their information-management processes. The solutions launched include: HP ePrint Enterprise mobile printing, HP EcoSMART Fleet, HP Imaging and Printing Security Center, HP Access Control Professional and HP Access Control Express. 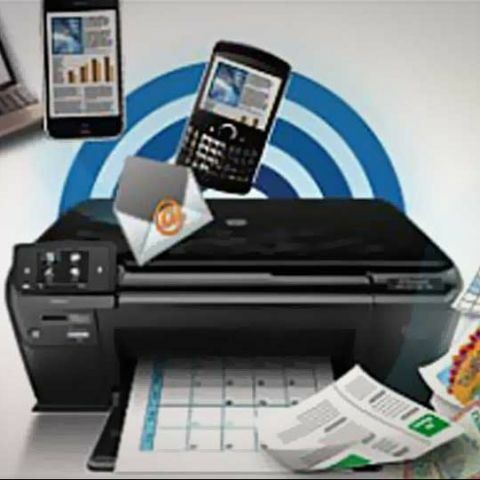 HP ePrint Enterprise mobile printing solution unleashes the full potential of mobile devices. It allows you to print documents efficiently with enterprise-level security, sending print jobs from remote locations for printing on arrival. It is a cloud-enabled web service that allows mobile users to easily print documents, presentations, reports and photos from an e-mail application to any registered network printer across the enterprise. It is a driverless printing application that can integrate with your existing IT environment. The simple email-to-print capability allows you to send a print job from a business email address to the company’s networked printers that have been assigned an email address. HP EcoSMART Fleet allows you to see your energy and resource use from one intuitive and easy to use interface. Gives you the information required to effectively monitor, manage, and control the environmental impact of your fleet. Businesses can reduce costs up to 30% and save up to 80% on energy usage in managed print operations through focused management of their printing and imaging environment. It works by collecting data from HP Web Jetadmin software and the HP Carbon Footprint Calculator, real-time status overviews are displayed. One can run scenarios to understand how limiting energy and carbon usage, as well as spending, might impact productivity. Easily maps consumption overtime, user defined, identifies high-consuming devices, and pinpoint opportunities for savings. HP Imaging and Printing Security Center is industry’s first fleet-level policy-based security solution that helps increase security, strengthen compliance, and reduce risk across your fleet of Imaging and printing devices. Allows to securely deploy and monitor devices as soon as they are added to the network by using HP Instant-on Security. Unique to HP IPSC, HP Instant-on Security automatically connects HP devices to the solution and immediately configures them to be compliant with the specific corporate security policy—saving time. It’s simple to enhance the policy for increased security beyond the baseline for specific departments or groups, such as your legal team. HP Access Control Express combines cost-control and security features. Offers users to print once to the server and “pull” jobs to any pull print-enabled HP LaserJet device. Pull printing virtually eliminates unclaimed documents hence wastage, enhances security by requiring authentication before releasing. Track detailed usage information for printers and MFPs. Create and customize built-in reports to address specific questions and concerns about printer usage by user, per device and department. HP AC Mobile Release increases convenience by allowing users to easily authenticate and release print jobs using their mobile device. HP Access Control Professional adding to thecost-control and security features of HPAC Express supports authentication through employee card access, allows managers to set and manage print policies. The new features include server-less pull printing, which lower costs, dual-factor authentication (pull and card) which adds an additional level to safeguard; and the ability to send jobs via email, which increases productivity. The Intelligent Print Management Module helps create custom printing rules for a smarter printing environment and help conserve energy and supplies by allocating costs by department. Hundreds of built-in, customizable reports can communicate the value and impact of printing, while the quota feature helps contain costs by allowing administrators to set print page volume limits for user groups. HP solutions and services pricing and availability varies by number of licenses, devices, no of employees and region. The solutions launched today are built on Open Extensibility Platform, HP’s device-independent technology1 that allows them to work across a fleet of both old and new devices. Businesses do not need to buy new devices in order to support the latest solutions; because all devices support one version of a solution and one solution supports multiple devices. These solutions can also reside on a FutureSmart server, which helps businesses future proof the imaging and printing fleet. It also allows one to manage solutions in the same way one monitors and controls the devices—using HP Web Jetadmin. With HP FutureSmart firmware, the entire fleet of HP FutureSmart devices can be updated with new features and capabilities as they emerge. Enterprise users can now enjoy a consistent, up-to-date experience, no matter which device they use. From a single console, the IT staff can remotely deploy HP FutureSmart updates across the entire fleet, ensuring keeping pace with technology is quick and easy. Confused for a mid-budget phone.